First off, my wife rocks. I mentioned to Jenna that it looked as if the 2014 Topps cards were out a few nights ago, as I was going through my nightly blog reading list. She filed that information away and had a stack of various 2014 Topps packs waiting for me when I arrived home from work on Wednesday night. She bought a few loose packs, a rack pack and one of those mini-blaster boxes from Target to make sure I had some variety in my pack opening. I'm a lucky man. Before tearing into the packs, I explained to my seven-year-old son Doug the concept of the annual "First Phillie." 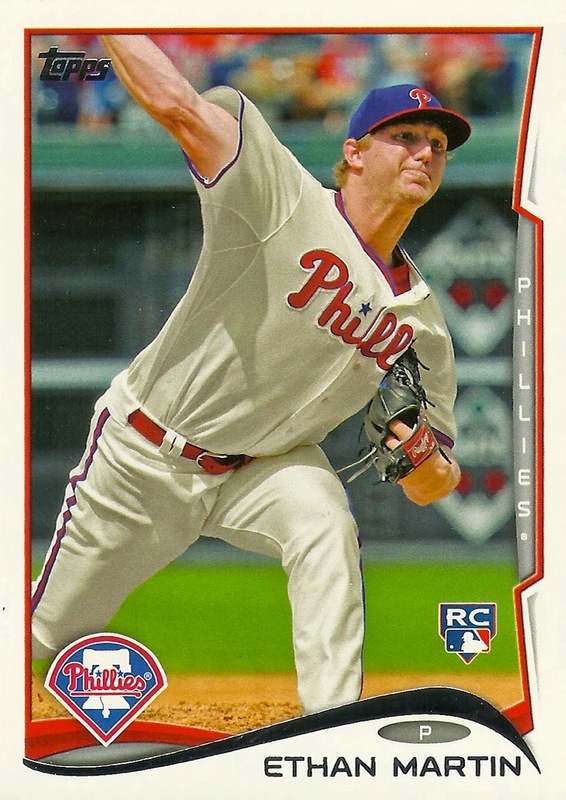 My Dad and I would buy our first new packs of the year from Wawa and then simultaneously open the packs until one of us announced we had received the first Phillies card of the year. 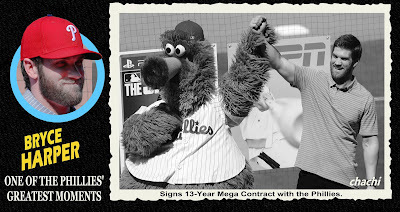 It was a little silly, but it was fun and if I thought about it long enough I could probably recollect most of the First Phillies from the past thirty-plus years. I let Doug open the first three packs until he came across the First Phillie, wanting him to have the honor this year. 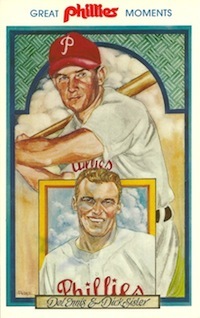 The card seen here wins the award this year, even though Doug's initial reaction to finding an Ethan Martin card was, "Well I've never even heard of this guy." 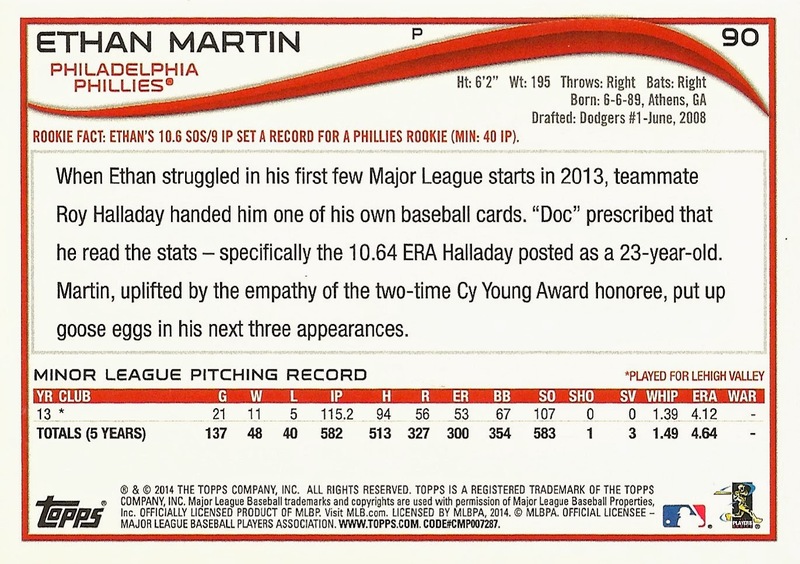 As proof that the photo-selection team at Topps has pretty good taste, they used the same exact photo of Martin on this card that I used for his 2013 Chachi card. The design of this year's Topps cards is decent, but it's not enough to make me want to go out and buy a bunch more of the stuff. The card fronts are actually brighter than I thought they would be, and the player's position returns for the first time since 2011. For the third year in a row the backs of the cards are very plain. I've already decided to track down a Phillies team set from eBay and save my pack-buying money for Topps Heritage when it comes out next month. I've had the same thing happen where a photo I'd used on a custom card later showed up on a Topps card. It's an odd experience. Do they still have cards at Wawa? While searching for 2014 packs, I was bemoaning (to myself) the lack of retail options left. I don't think Wawa had cards in 2013. Target had singles packs, Racks, and Hangers. First card of 2014 for Team Phungo was Caarlos Ruis (pulled by Mrs Phungo) first insert was Target Red of Ryan Howard. probably will get to posting some more on these next wk. I do the "first Dodger" thing, too. I probably could tell you which one was first the last few years and way back in my first years of collecting cards, but the middle would be a haze. Nope - no more cards in Wawa. That's the only way I used to be able to get cards unless I went to an actual hobby shop or a baseball card show. Two places I can sometimes find cards besides Target, Wal-Mart and card stores/shows are Five Below and a local 5&10 store near me in the western suburbs of Philly. Unfortunately neither have cards in yet. So I am going to have to hit a Target this weekend. In other good news, the Phillies equipment truck left yesterday!